a book chick: "The Night Train"
my take: If you've never read Walking Across Eygpt, stop reading this and go find it and get back here when you're done. Really. That's the best of Clyde Edgerton. Well, Lunch at the Picadilly is fabulous, too. If you've read those, you know why we persist in reading through all this man's books. 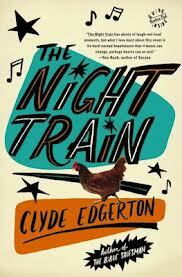 The Night Train is about the intersection of Blacks and Whites in a small town in the South in the 60's mostly through the two main characters, teenagers who work together at a furniture repair shop. What they both love is music and they each discover their genre. There are several typical Edgerton quirky scenes - he can make the craziest things happen in a story. It should have been a short, quick read but I let it drag on much too long. I think a sound track to go along with it would have made it an even better reading experience.